Alphabet of light is a language based on light intended to convey freedom, an elementary principle generating an open system. BIG starts from an abacus of essential geometries to design a new font that translates into light, an alphabet used to write and to express one’s thoughts, a tool to give shape to spaces. Two linear elements of different lengths and two round ones are combined with a system of letters, numbers, and symbols. The round elements, available in two diameters, can be separated into modules to join the linear elements together according to different angles, thus designing everchanging geometries. These simple base modules, with specific geometric proportions, can be combined with each other to create countless basic or more complex, linear or curved structures of light, thus producing suspension appliances matching with architectures or space functions. 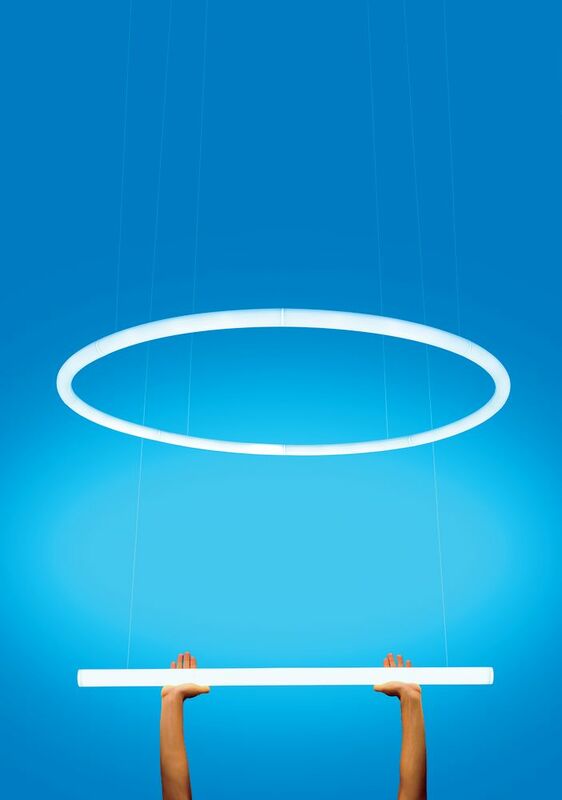 The idea of BIG joins the optoelectronic competence of Artemide to define an innovative construction principle and provide continuous and comfortable lighting. While it has a minimal presence, it encloses groundbreaking patented optoelectronic and mechanical innovation. BIG is a group of architects, designers and thinkers operating within the fields of architecture, urbanism, research and development with offices in Copenhagen and New York City. BIG has created a reputation for completing buildings that are as programmatically and technically innovative as they are cost and resource conscious. BIG’s recently completed projects including the Danish Maritime Museum (2013), Superkilen (2012), the 8 House (2010) in addition to the first project the Copenhagen Harbor Bath (2003), an urban space that transformed the area of Islands Brygge from a rundown harborfront to the recreational and social center of the city. Current projects under construction include: West 57th, a 750-unit residential building in Manhattan; the Vancouver House tower in Vancouver; the LEGO Brand House in Denmark; the Faroe Islands Education Center; the Shenzhen Energy Mansion in China; and a Wasteto-Energy plant in Copenhagen that will double as a ski slope.